This is not crafting by necessity. This is not crafting to kill time. This is crafting to claim identity, to save the world from soulless junk. To casual observers it looks like adults making toys and keeping them. But this is a resurgence with a vengeance. Subversive crafting groups suggest their dissident sociocultural and socio-political positions with humorous group names with overt illicit drug references, such as ‘Dirty Needles’ and ‘Yarn Junkies and Needle Hoppers’. Facebook crafting groups are named with tongue-in-cheek humour – ‘Radical Knitting’ and ‘Subversive Cross Stitch’, as well as ‘Renegade Artist Coalition’. 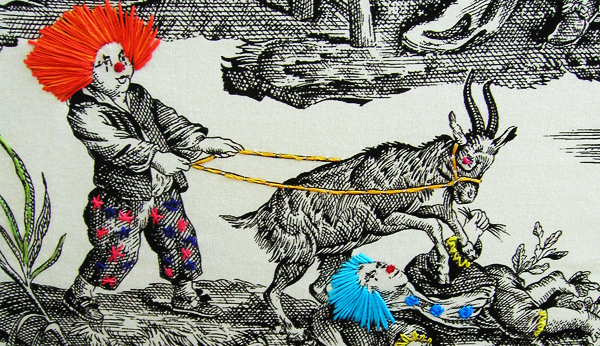 However, crafters have proved themselves more than able to stand up for one another. In 2012, an event called The Ravelympics, in which participants competitively crafted while watching the Olympics, was served with cease and desist from the US Olympic Commitee (USOC). The USOC was ultimately forced to apologise, twice, as a result of massive pushback largely expressed through social media, demonstrating the fearlessness and social influence that crafting communities can wield. In a time when planned obsolescence and increased consumption cannot be sustained, crafting is well positioned as an alternative approach within consumerism. Within the Western capitalist cultural landscape, subversive crafters concurrently exist as part of tradition while redefining the domain. Even as it occupies many traditional craft tropes, subversive crafts exist in opposition by employing visual cues about the current political topics by utilizing vernacular from popular culture. Accordingly, subversive crafts challenge the preconceived notions of crafts, crafters, and by extension, femininity. 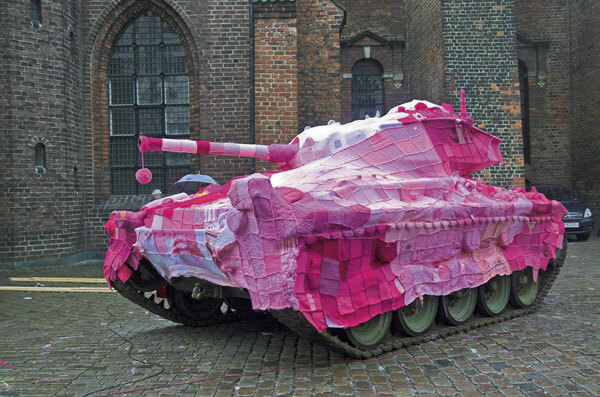 Tank wrapped in pink by Marianne Jorgensen. Protest against the Danish (USA’s, UK’s) involvement in the war in Iraq. Marybeth C. Stalp is an Associate Professor of Sociology at the University of Northern Iowa. She received her B.A. in Sociology, Communications and English Literature from Regis University, her M.A. in Sociology from Southern Illinois University at Carbondale, a graduate certificate in Women’s Studies and a Ph.D. in Sociology, both from the University of Georgia. Her research is centered in gender, leisure, and culture, and includes US women quilters, North American handcrafters, the Red Hat Society, and women and men craftartists. Her recent work includes the book, Quilting: The Fabric of Everyday Life and research articles appearing in the Journal of Contemporary Ethnography, Journal of Leisure Research, Sociological Perspectives, Journal of Women & Aging, Sociological Focus, Gender, Work, & Organization, and Textile: The Journal of Cloth & Culture. Therèsa M. Winge is an Assistant Professor of Apparel and Textile Design at Michigan State University. Common throughout her research and design, she focuses on the construction/deconstruction of visual and material cultures. Her research examines subcultural dress for its meanings and construction of identity, which informs and inspires my designs and creative scholarship. She deconstructs the bricolage of specific subcultural dress for its significant elements that contribute to the construction/creation of my conceptual apparel designs, utilizing both traditional and innovative techniques and methodologies. She recently published a book about subcultural body modifications—Body Style (2012).